Mix everything together, adding the syrup until sweetened sufficiently. Leave to sit in the fridge for at least six hours or preferably overnight. Combine the raspberries and syrup in a pot and allow to cook for approximately 5 minutes on a medium heat. Stir often to prevent the compote from burning. Add the remaining ingredients and continue to cook until the mixture is a thick consistency. Break down any raspberry pieces which may be too big before removing from the heat and allowing to cool down. Once cooled, store in the fridge until ready to use. In a bowl, mash up the banana before adding all the other ingredients. Stir well, before covering and placing in the fridge for at least six hours (but preferably overnight). 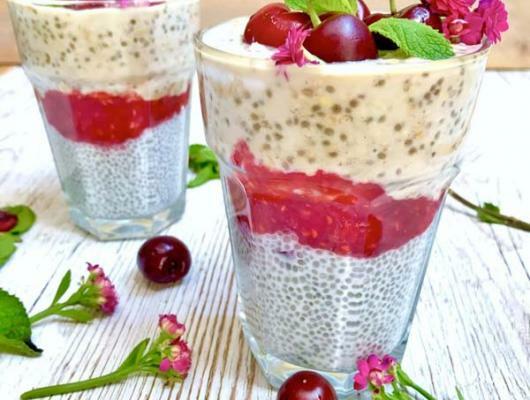 The next day, layer the pudding in serving glasses by firstly adding the chia pudding, then the compote and lastly the overnight oats. Garnish with fresh cherries and mint leaves, before serving. Leaving the jam to stand overnight (either in the fridge or at room temperature) will create the perfect consistency for this recipe. The compote can be stored for over a week in the fridge when kept in an airtight container. 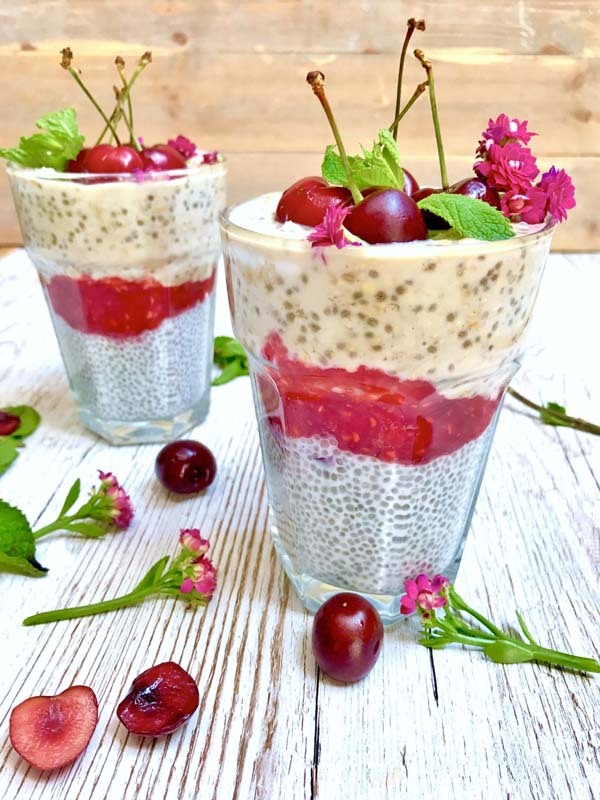 These delicious vegan overnight cherry chia seed puddings are a healthy superfood delight that can be enjoyed at any time of the day!